*(Free for Kindle Unlimited) Did You Know, you can grow Organic Fish and Vegetables on your Patio? Here’s How. (Deal, Not Free) by Tom & Lisa Deems. Price: $39.93. Genre: Nonfiction Book Deal, Sponsor, Gardening, Aquaponics. Rated: 5 stars on 1 Reviews. 134 pages. ASIN: B01JJYT41S. Get a Free DIY Bell Siphon Book, [Downloadable PDF Version] Courtesy of Trout River Aquaponics. Posted on March 30, 2017 Author KibetCategories Aquaponic, Crafts, Free Prepper ThrillerLeave a comment on Kindle Gardening Deals for Thursday! *(Free for Kindle Unlimited) Did You Know, you can grow Organic Fish and Vegetables on your Patio? Here’s How. (Deal, Not Free) by Tom & Lisa Deems. Price: $39.93. Genre: Prepper Deal, Sponsor, Gardening, Aquaponics. Rated: 5 stars on 1 Reviews. 134 pages. ASIN: B01JJYT41S. Get a Free DIY Bell Siphon Book, [Downloadable PDF Version] Courtesy of Trout River Aquaponics. *Vertical Gardening 101. by Susan Winchester. Price: Free. Genre: Crafts, Hobbies & Home, Gardening & Horticulture, House Plants. Rated: 5 stars on 6 Reviews. 24 pages. ASIN: B01BETZWV2. Posted on March 30, 2017 Author KibetCategories Aquaponic, Crafts, Free Kindle Gardening Books, Free Prepper Thriller, Horticulture, plants, VegetablesLeave a comment on Kindle Gardening Deals for Wednesday! 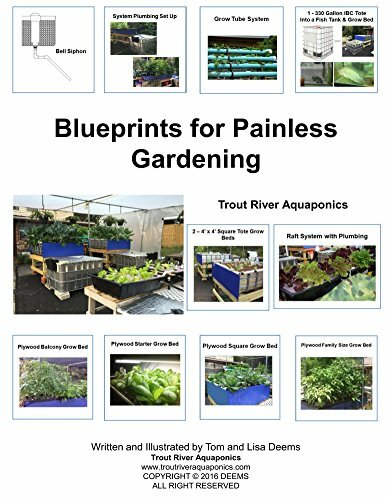 *Learn to Grow Organic Vegetables & Fish: Blueprints for Painless Gardening by Tom & Lisa Deems. Price is: Free. Genres are: Pepper Book Deal, Sponsor, Gardening, Aquaponics. Get a Free DIY Bell Siphon Gardening & Aquaponics Book [Downloadable PDF Version]. Posted on March 27, 2017 March 27, 2017 Author KibetCategories Aquaponic, Free Kindle Gardening Books, plantsLeave a comment on kindle Gardening Deals for Sunday!